In a bizarre turn of events this evening Manchester United manager Jose Mourinho has decided to walk from the team hotel to Old Trafford with the United team bus stuck in traffic. 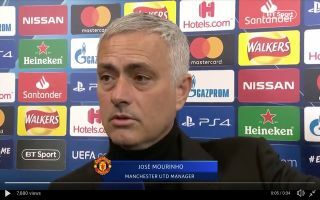 Mourinho opted to walk to the ‘Theatre of Dreams’, deciding to put his hood up to avoid being spotted by fans, Mourinho later told BT Sport that the walk took him “only two minutes”, whereas the journey in the team bus took a staggering 45 minutes. "I walked in a hoodie, in the middle of the fans, no one recognised me. I took two minutes." Mourinho opting to walk to the stadium shows that the Portuguese boss means business tonight. The stakes can’t be much higher for the Red Devils this evening with Cristiano Ronaldo returning to Old Trafford sporting his new Juventus colours. United will certainly be hoping to spoil the superstar’s homecoming.